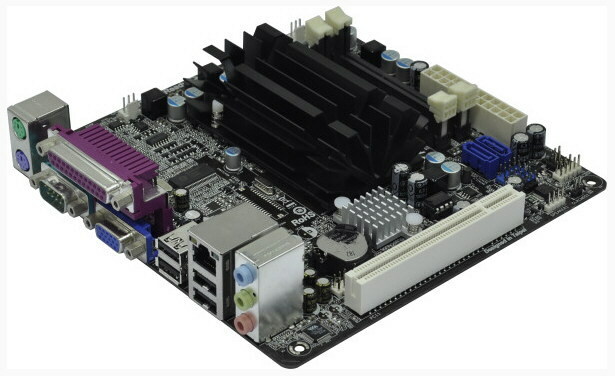 The Taiwanese company ASRock today introduce three Mini-ITX Cedar Trail motherboards AD2500B-ITX, AD2700B-ITX and AD2700-ITX targeting HTPC users using small form factor size which will be shipped very soon. This family uses a 32nm Atom processor which is pre-installed with a passive cooling system, the AD2500B-ITX feature an Atom D2500 CPU with two cores clocked @ 1.86 GHz and has a1 MB L2 cache, the AD2700B-ITX and AD2700-ITX use of a higher-clocked D2700 (@ 2.13 GHz ). All three models have a passive cooling solution for the CPU. The AD2500B-ITX and AD2700B-ITX both include a D-Sub output and 5.1-channel audio, while the AD2700-ITX provides D-Sub, DVI and HDMI ports and 7.1-channel sound. Also the two D2700-powered boards offer two USB 3.0 connectors using an ASMedia ASM1042 controller. ASRock's Cedar Trail motherboards feature the Intel NM10 Express chipset, two DDR3 SO-DIMM slots (supporting up to 4 GB of RAM), two SATA 3.0 Gbps ports, one PCI slot, an Ethernet port (10/100 Mbit on the AD2500B-ITX, Gigabit for the other two), UEFI BIOS, and proprietary extras like ASRock Instant Boot, XFast USB and XFast LAN.